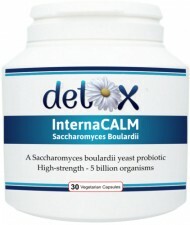 A high-strength Saccharomyces boulardii probiotic yeast with 5 billion cfu organisms per vegetarian capsule. Able to survive stomach acid, Saccharomyces boulardii is a hardy, acid-resistant, temperature-tolerant micro-organism that is not affected by antibacterial agents or antibiotics. This yeast works as a ‘probiotic’ by colonising the intestinal tract and supporting the growth of friendly bacteria and a healthy gut flora balance. Source: from lychee or mangosteen. In addition, early results from research have found that Saccharomyces Boulardii appears to reverse coeliac disease in mice. For more information take a look at this article. Contains no: gluten, wheat, lactose, added sugar or artificial colourings. 1 capsule, 2 - 3 times per day between food or as required. Up to 6 capsules per day can be taken if required. This product is stable at room temperature, but may be refrigerated to preserve freshness.